This is one of my favorite salads. It is more of a spring or summer salad, but I love it so much, I can eat it any time of the year and just pretend that it is warm and sunny. I wish I had come up with it, but it is adapted from Healthy in a Hurry. I highly recommend this cookbook! I have made many of the recipes and they have all been delicious. The original recipes calls for raw diced onion, but since my taste buds don’t agree with raw onion, I have added rice vinegar to give som edge. Use quick cooking barley and cook according to instructions. When the barley is done, mix all ingredients incl. bacon. Mix olive oil, lime and rice vinegar. Dress, season and serve. If you don’t have lime, use juice from 1/2 orange and 1 lemon. Try substituting cilantro with parsley. If you can’t find quick cooking barley, just use regular barley. It takes 1 hour and 10 min to cook, but you can cook the barley in advance and assemble the salad in minutes the next day. 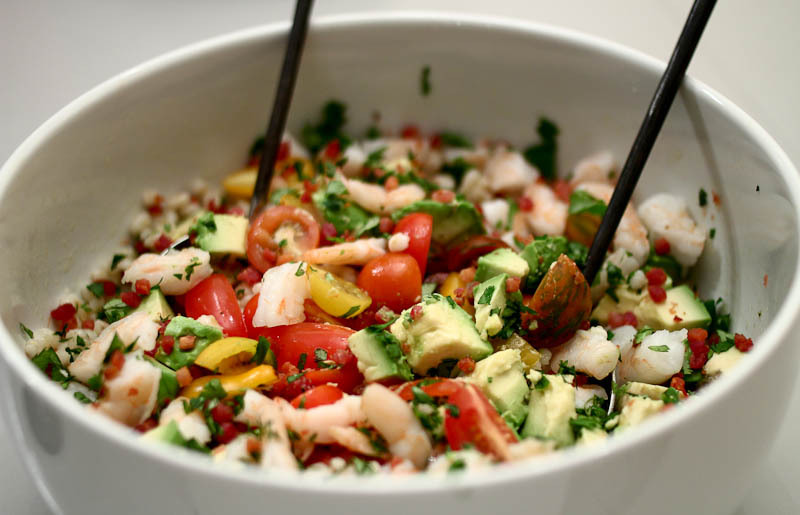 This entry was posted in Dinners in 30 min or less, From the sea, Salads & sides and tagged barley, dinner, Dinner in 30 min, healthy food blog, perlebyg, perlebyg salat, quick dinner, rejer, salad, shrimp. Bookmark the permalink.